Texas Lt. Governor David Dewhurst, the 2011 Border Texan of the Year, selected South Texas College's Valley Scholars Program to be one of four recipients of the proceeds from the 2011 Border Texan of the Year Dinner. Dewhurst presented STC President Shirley A. Reed with a check for $8,000, which will be used to provide scholarships to academically gifted students. "The future of Texas is being forged in our classrooms and universities every day, and I'm so proud to see that South Texas College is providing our talented students with the tools they need to succeed in school and in life,” Dewhurst expressed. STC’s Valley Scholars Program was founded to provide the financial assistance, academic support services, mentoring and leadership development to help academically talented and highly motivated students be successful in college. Program graduates have gone on to study at premier universities around the nation including The University of Texas-Pan American, Texas A&M University, The University of California and Emerson College. They have become doctors, lawyers, teachers and professionals making a difference in the Valley and across the state and nation. For more information about STC’s Valley Scholars Program call 956-872-1952 or visit http://academicaffairs.southtexascollege.edu/academicexcellence/valleyscholars/. Texas Lt. 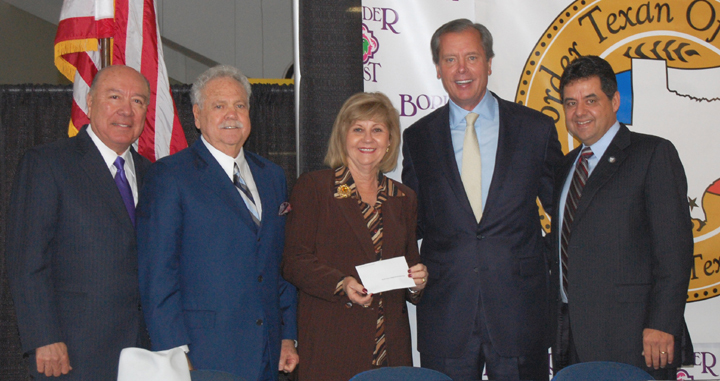 Governor David Dewhurst presents South Texas College Valley Scholars Program with an $8,000 check. From left are the 2012 Border Texan of the Year and Texas District 20 Senator Juan “Chuy” Hinojosa, STC Board of Trustees Chair Gary Gurwitz, STC President Shirley A. Reed, Dewhurst, and Hidalgo Mayor John David Franz.